Peter Wilkinson installed as Master of the Worshipful Company of Tin Plate Workers alias Wire Workers - P. Wilkinson Containers Ltd.
Peter Wilkinson, Managing Director of P. Wilkinson Containers Ltd. and William Say & Co Ltd., was installed as Master of the Worshipful Company of Tin Plate Workers alias Wire Workers, the livery company representing the metals industry, on July 10, 2018. The installation dinner, held at Mansion House, London, followed a meeting of the Court of Assistants, the livery’s governing committee, where the new master was installed. Peter Wilkinson has worked in the metal packaging manufacturing industry for over fifty years, after joining the family-owned business, P. Wilkinson Containers Ltd., in 1966. Wilkinson Containers Ltd., now one of the largest manufacturers and stockists of metal and plastic containers in the UK, was established by Peter’s grandfather, Percy Wilkinson. In the 1930s, Peter’s father, Denis Wilkinson, began a partnership with William Say and built a can making factory in Wapping, London. Peter oversaw the company and its sister, William Say & Co. Ltd., expand and move from Wapping to the current three-acre site in Bermondsey. William Say & Co. Ltd. is now London’s last independently-owned can maker which is powered by its own solar farm installed on the factory roof. In 2010, Peter was joined by the fourth generation of the family, his sons, Garth Wilkinson as Financial & Operations Director and Stuart Wilkinson as Sales & Marketing Director. The Master’s guest speaker at the dinner was Air Commodore Rick Peacock-Edwards CBE AFC, a Past Master of the Guild of Air Pilots and Air Navigators. At the installation dinner, ladies were presented with a unique gift, as is tradition, designed by the team at William Say & Co. Ltd which included a tree sculpture made from copper wire inside a personalised tin made at the London factory. 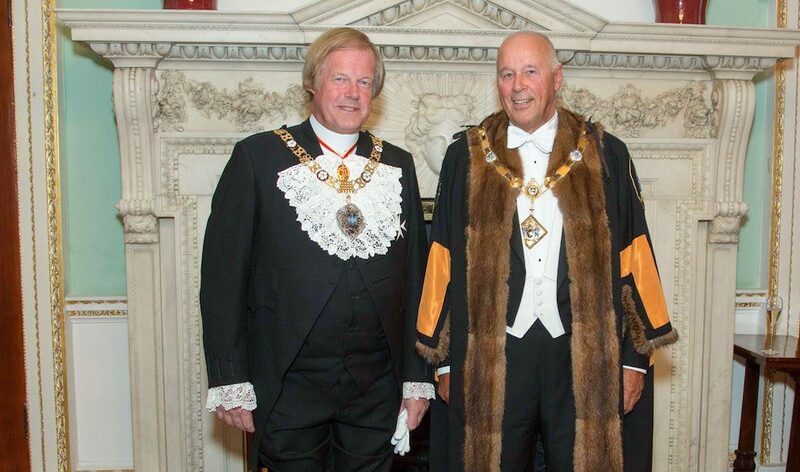 The dinner was held in the presence of the Lord Mayor locum tenens Sir David Wootton and Lady Wootton, together with Aldeman and Sheriff Timothy Hailes and his consort, Ms Fiona Adler and Sheriff and Mrs Neil Redcliffe.